A mountain house must have as many fireplaces as possible to keep your body parts as warm as possible…and we are up to four (living, family, master interior and master exterior). I wish that designing a fireplace were as easy as throwing in a box and tiling around it, but making sure that they work for code, work with the materials already in the space and yet are custom and not builder-grade takes a lot of time. Let’s walk you through the whole process. This is the space we are calling the family room. It’s off the kitchen and dining and will have huge scenic doors out to the lower deck. This space will be mostly dedicated to rec, meaning Brian’s yet to be purchased pinball machine, but will have a TV for movie nights if the grownups are in the living room and we want to not parent. The copy on the above photos was before you guys suggested to get rid of the stairs altogether—YAY, so those are now totally gone. 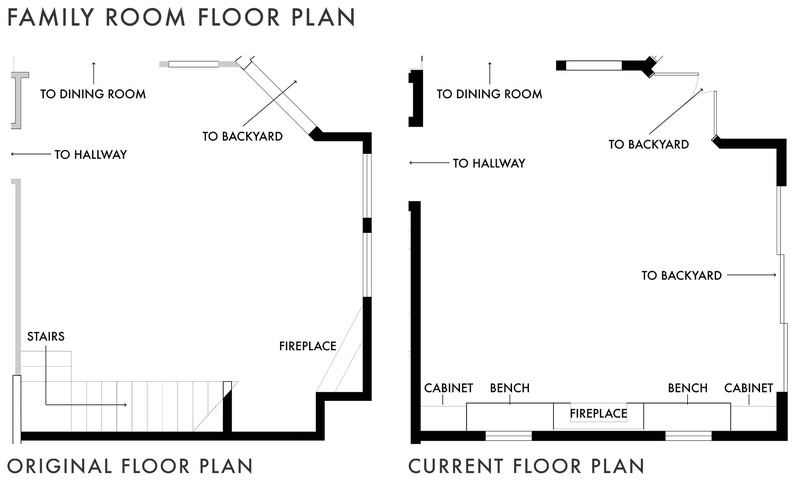 Below you can see what the space looked like when we first bought the house and where we landed with the layout, better symmetry and flow of the room to the outdoor spaces. We seriously debated putting the fireplace in here as it is mostly a family room, but then as we were up there this winter, before the demo, we realized that fireplaces are magical and change the ambience and mood of a room in an instant and this room is cozy and likely where the whole family would hang out and play games. This one would be gas-burning (so it’s easy to turn on and off with a switch) and it will have a screen for protection. It can’t be opened and has a protective glass front, but we’ll obviously not leave it on if just the kids are playing. She arrived and is currently being installed, but before we could tell them where to put it, we had to actually design it. First things first: the height of the box. This had to be determined by whether we wanted a hearth underneath (for code). The width of the box would also be dictated by the materials that we chose to surround it in. Plus, we had two windows flanking it, so…what should happen underneath those? I tasked Julie from the design team to start pulling together some inspirations. We wanted to keep it clean and minimal but with some warmer elements and it still had to speak to the living room fireplace (which we still might change). While the above would be too cold for us (there’s NO WAY Brian would go for something on the opposite spectrum of “rustic”), it did give us the idea to try for a plaster finish in white. It would still work in the house in terms of design vibe and be SO pretty. The above and below photos are pretty similar to where we landed. 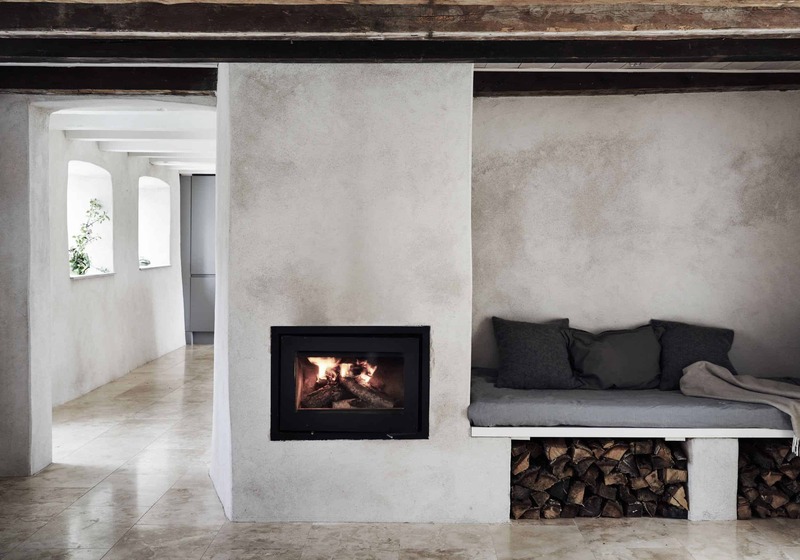 We love the combination of plaster, black box and firewood under some built-in benches/ledges. I want to note that most of the fire boxes in the inspirations here sit high enough off the ground that we didn’t need a stone hearth intruding or jutting into our beautiful wood floors. There was also some talks about going with a gray plaster which has a bit more movement and visual texture, like this one below. 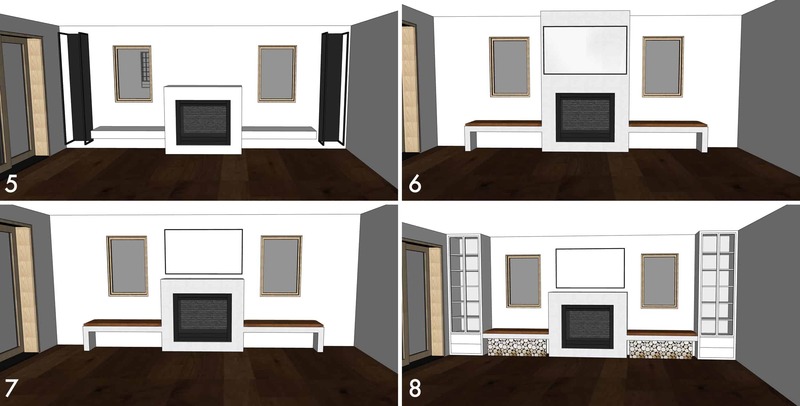 Regardless of color, we did decide on the plaster, so Julie started creating some renderings of design options…let’s walk through them. 1. We knew we were going to put a TV above the box and liked the idea of having benches below so that the fireplace didn’t feel lonely. It needed more to ground it in the space, but it didn’t feel finished and the TV really got all of the attention. 2. Then there was the possibility to continue the center piece all the way to the ceiling line but that made it feel very top heavy and would place the TV further into the room, making it hard to watch from the sofa. 3. We played around with the idea of vertical storage for pretty logs off to one side. This asymmetrical layout works but you could only have the option of storing wood and nothing else, so that felt pretty limiting. 4. By adding two vertical structures on the sides, the TV felt more balanced, but it was still too heavy for the space. 5. We liked the open look of the “floating” bench but that felt too modern for the overall style of the house. And those log holders are pretty much perfect but again, they would leave us without the storage functionality we would really need for this space (we need somewhere to store games, toys, etc). 6. Moving away from the overall shape of the fireplace and onto what material it would be helped make the final decisions. The benches now would work style wise but it felt unfinished and still too heavy in the middle section in this option. 8. The glass cabinets flanking the benches added the necessary storage and balance to the overall space (and we could store logs under the benches which is good for practicality and also just feels really…mountain-y). So that’s where we landed…#8. It has a great focal point of the fireplace, balanced out by the bookshelves full of storage and the TV is at a great height but isn’t the only thing to look at. The depth of the bench is 18″, making it deeper than your average bench but not daybed depth (I love a daybed depth, but it would encroach too far into the room). We have a leather pad on top to add more warmth and of course a few pillows, in a fabric that is still TBD. The black color of the cabinets helps to tie in the interior black brick panels of the fireplace. We didn’t want your eye drawn to a big-black-hole-of-a-fireplace in the middle of the room, especially since we get to use The Frame TV by Samsung in the space (again my design prayers have been answered with this TV). The opening under the benches are 12-inches high by 53-inches long and the depth, again, is 18 inches. It can either store our birch logs (purely for decoration, of course), although now I am pretty terrified of a bug infestation after all the comments from the previous fireplace post, or we have the option for a couple of baskets underneath to hold all the kids’ toys. Since the living room fireplace got a revamp with the ‘German schmear’, we wanted the family room fireplace to look cohesive in the house and the white plaster here helps keep it clean stylistically but gives it the texture it desperately needed. The texture of the plaster in the renders isn’t the exact look we are going for. We would do something a bit smoother without looking too much like a new build. The cabinets have a lot of open shelves for all those pieces that we would want to style out for shoots but also has a lower cabinet for games, toys, and extra blankets for those chilly family movie nights. In the lower part of the cabinet, there is an 8-inch deep drawer and then two shelves that are 30-inches wide and 15-inches deep. There you have it, we are about ready to send off the plans to Jeff our GC so if you have any suggestions, leave your ideas in the comments below. Get a gas fireplace with fake logs!!! Yes I know it’s heresy. We have a woood burning fireplace at our weekend cottage and every weekend while we’re running around like maniacs packing up, my husband has to shovel out the still smoldering embers…I converted all my fireplaces in full time house to gas with fake logs and it’s soooo much cleaner and easier! She is! She mentions that the fireplace is gas-burning at the beginning. The log storage was just for show which I looooove! Ah I see after re-reading! Totally do not understand why anyone would choose to have logs in their house just for show!!! I’m sure it will look pretty but to me that’s like having books in your house that you’d never read! I was at s friends house the other day who is lovely but not super stylish… she used a decorator and her house is amaze balls but she has all these VERY arty design books on her book shelves that so obviously were picked by her decorator…it seemed so incongruous to me! Kind of like stacks of logs for a non-wood burning fireplace…but hey! I love Emily’s style so you do you girl! Ditto on the logs for show. Couldn’t see it in my own house, but as Kelly said, you do you. You have great design skills. Since this might be the kid TV viewing room, does that especially make the TV location too high? Can you do your projector somewhere? I think it looks gorgeous! Well done!! I think it looks a lot better when the fireplace box goes up to the ceiling. This maybe looks like you’re trying to squeeze in a little bit of everything and your losing the minimalist look that’s in all your inspiration pics. Could the tv go? I disagree. I love that you’re taking this minimalist inspo design, and tweaking it for this house. I love the look, and appreciate how it suits your family’s lifestyle in this home. I also totally disagree with the comment below about the black shelves not working – they balance everything out IMO, and the darkness ties it all together. Good job on another incredible design! yahoo — I LOVE Samsung’s ‘the frame’!!! (who wouldn’t? )… hope you’ll do a nice long post – with lots o’ details – once it’s up and running. ‘the frame’ would be ideal on my folks’ floor-to-wood-ceiling [limestone] fireplace. it’s the only logical place for viewing in their LR, but a plain TV would look cheesy… so, they’ve gone without for 65+ yrs. At 93, Mom is FINALLY wanting to spend time in her beautiful living room (she’s been ‘saving it’…), and it’ll need a TV. I’m certain she’ll love the frame’s ‘disappearing act’ — just need to convince her it’s a smart investment. The Frame has a wall mount kit you can order, thats the mount so that it sits flush to the wall and looks more like a piece of art rather than a TV. The Frame TV will look great – but I would agree with having the fireplace go all the way up – 18″ depth fireplace with a TV above it ends up encroaching on the bottom part of the screen when you are sitting down and staring up. We have a gas fireplace that sticks out that much, unfortunately, and we could never put a TV above it without not being able to see the bottom. If they had built the wall out above it as well, we may have been able to swing it. I think the black shelves look great! Agree! I like when it goes all the way up! I agree with Laura about the black shelves. And with whoever said what they said about the bug issue with logs. Plus, whenever we get a cord of wood delivered to burn in the fireplace, it is not evenly cut birch logs. it’s whatever will burn that is cut to approximately the length of what we need in our fireplace. Would you burn those perfectly cut to length and uniform diameter logs chosen from MANY? Can you tie in logs some other way?? Do logs seem off altogether if they are being placed next to a gas fireplace unit? Should displayed logs (decorative or for actual use) be next to the actual wood burning fireplace? 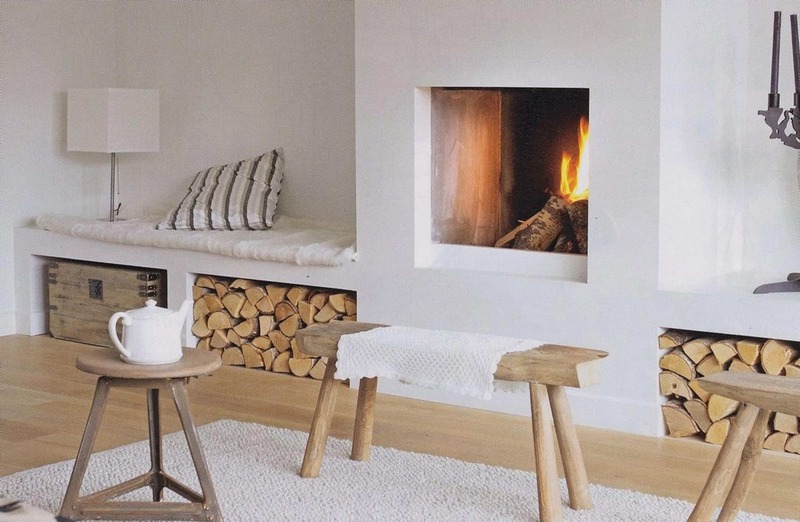 From the inspiration images, the logs next to the wood burning fireplaces feel the most effective. Plus, if this is the log storage for the stone fireplace, are you really wanting to walk logs across the house? Agree about the shelves. I think white and blonde wood would tie in better with the windows and soften the edges of the room. In the rendering, the shelves seem a little like hulking towers. This is going to be stunning and honestly, could be the coziest room in the house when it’s all said and done! But you will regret regret regret any wood storage like those in your renderings. Wood is dirty, dusty, and bits fall off ALL the time. Critters live in wood piles too. Ours is always a mess so we keep a small stack near the door. Never decorate with firewood. Those picture perfect photos will never happen in real life. My 2 cents. I had a giant stack of rustic wood in a built in shelving unit in my previous house for years and it was great! It wasn’t messy because nobody touched them. Once in awhile I would run the vacuum hose over the fronts and in the crevices to keep them from getting dusty, which worked like a charm. Bald birch…..you’ll be fine. If the wood has been kiln dried, or purchased at a home decor store I think you’re going to be pretty safe regarding the bugs! Now if it was plucked out of the woods and still damp it would be a much different story! I love the design here so much and think it’ll pull a lot of the house together without being overbearing! I have similar wood storage and LOVE it! We use it for our wood burning fireplace but I love it for aesthetics just as much! And it’s not messy at all. The only time it flakes is when you are putting the wood in and even then it’s not that big of a deal… just vacuum real quick! I think it will be a real highlight! wood is wood. had birch in Nebraska. Yep – a mess. We have not attractive logs in our mountain house and after 2 years I can attest to no bug infestation. I like the round birch log look, but LOVE the idea of kid storage more. Also, make Brian happy. If the logs get to be too much – burn them and switch out to the baskets (win win). I think kiln dried wood is fine. I don’t think you bring in critters and not as dirty. Why do you have space for logs if it’s a gas fireplace? It looks a little busy, I agree with the previous comment that suggested changing the color of the cabinets on the ends. Yes, this. It feels really inauthentic to me to have wood storage for…decorative wood? That you won’t/can’t use? Store something else under there. How about books. Turned spine OUT. it is KINDA gimmicky, .What I forgot to tell you guys because I was rushing was that we would likely do that for a magazine shoot but if we need the storage we can do bins for the kids. Brian loves the wood, i love the look of the wood,. but we’ll see! Spines IN is the most ridiculous…. Loving the family room! In the last couple renderings I thought you almost forgot to tell us about the landscape art flanking the TV. Nope, that’s going to be the gorgeous view. What we the plans for the windows to help with light control while watching TV? I’m partial to light filtering shades, which I think you used in your hillside home too. What a great use case for the frame TV! I would strongly suggest you have the tv at eye height when someone is sitting on the sofa by whatever means necessary for comfort and to reduce neck strain. Agree with this. I get the aesthetic reasons for putting the TV (especially the beautiful Frame TV) above the fireplace, but man, is it one of my biggest pet peeves. I find it so uncomfortable to have to look so high up at the tv. What about going the projector route again (w/ some good black out shades)? Also, is doing a faux log stack in lieu of the real, possibly bug infested, not actually needed, stack instead tacky? Maybe it could cover up additional tv-related accessories (apple tv, gaming system, etc.) when you don’t need it. Otherwise, I love it so much! It definitely still feels cozy & cabin-y to me! Agree about the TV height. My MIL had a TV over her fireplace and even though the room was massive and the TV was massive, and we were thus sitting far away from it but still could see it clearly, it felt awkward. People say “eye strain” but I’d call it visual strain since even if my neck and eyes were fine, it hurt my brain to have it up there. We also never used the fireplace at my MIL’s, not even once, not even in the winter, not even when it was cold and dark. IMO, fireplaces are overrated, but if you’re going to have one, a small one is just as good as a large one, and might allow for moving the TV down a bit. I also agree with the commenters who find it bothersome to be storing wood despite having a gas fireplace that needs no wood. Agree with this 100%. I was really surprised to see a TV above the fireplace in a rendering from EHD. It’s like sitting in the front row of a movie theater. Not fun. Yes that is my thought totally. TV looks good up there but not a comfortable viewing height at all! I love it. I am not a fan of TVs on top of fireplaces (and would prefer that the fireplace column go all the way to the ceiling) but having a TV that looks like art when it’s not on should help. I especially love the window cutouts. Why aren’t the cabinets the same depth as the bench? or at least the closed storage part with a little counter on top? Your kids are a little older than mine is so maybe it’s less of an issue but all I see are the corners of the bench that could hurt tiny heads. If everything is the same depth it’s no longer an issue. I also think it would be visually cleaner. Why can’t you do a floating bench? Ours has metal braces holding it up that are attached to the studs. Our gorgeous concrete hearth/bench really does appear to be “floating” since it’s only ~16 inches off the ground you don’t even see the braces. I really think a floating bench would make for a cleaner look here. 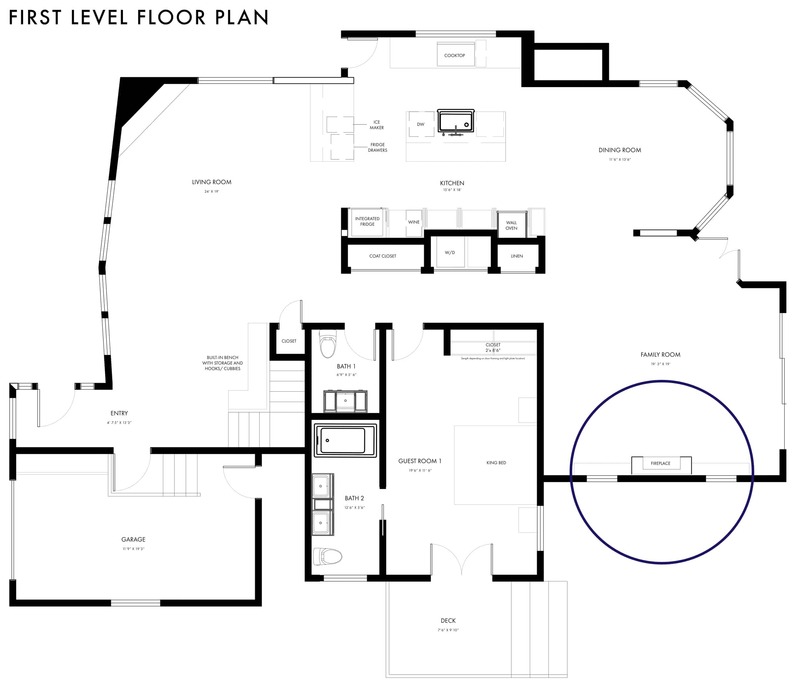 I am not a designer, but to me the room feels squat and cluttered and I don’t like the proportions. I can’t stop seeing a face either- window eyes, tv nose, fireplace mouth. Ha! I would take the fireplace to the ceiling to give it height and I would eliminate or shorten the shelving and do them in wood-white or natural. The fireplace should be the focal point and to me the tall, dark shelves compete and distract. Tv? I don’t know. Maybe ditch it and project onto the fireplace wall?? Ha! I see a face too (kinda like a polar bear) but I definitely experience pareidolia (seeing faces in everything) so it doesn’t bother me too much. I agree about removing the dark shelves, though, and letting the walls breathe a little more. So incredibly gorgeous! Just not sure why you would have wood storage next to a gas fireplace? Also I’d be worried about bugs/termites too….. I absolutely love the design, as usual! 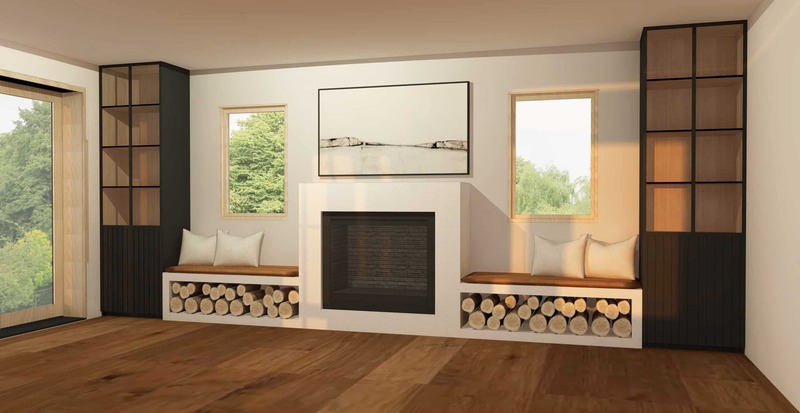 My one question is about the logs under the benches– since this fireplace is going to be gas, would these simply be decorative or would the logs be used in the living room fireplace? If you are going to install a gas fireplace why dedicate any space to wood storage- you wont be using it at all! I do love the look for photos, but for life… it will collect dust bugs and spill out bits of bark constantly. And some guests will be confused and try to get wood into the gas fireplace. I suggest storage benches for blankets games or other items you want to hide. I commented above too (but it’s not showing up yet?) and I completely 100% agree. Designers of the world, stop with the for-show-only wood storage. It’s a gas fireplace. If you have a wood burning fireplace or stove elsewhere in the house- design in some beautiful PRACTICAL wood storage there. Real wood that you burn is messy and would not be fun to fit under those benches at floor level. Waist height large opening in wall or open storage or something along those lines would be easiest. Im sure you can figure out a creative way to make it look good too! I also find the ‘wood storage even though it’s a gas fireplace’ look hilarious (SORRY BRIAN) – you will certainly end up with someone putting a log in the gas fire at some point. And the fact that the fireplace box isn’t recessed into the wall / doesn’t go to the ceiling makes it look modern rather than rustic (since it’s clearly gas). I live in a super old house with tons of wood-burning fireplaces and a wood burning stove (hello, New England), and dealing with wood way more than I’d like I can tell you even beautiful birch decorative logs are still … wood. Stacked like in the photo, they will decay over time, build up moisture, make a home for unwelcome carpenter ants, etc. It all just seems a little too “faux,” while being too real for convenience! Nix the wood, embrace the gas/modern look here. Bring in rustic with accessories (Pendleton blanket those benches out big time, or use plaid or felt bins instead of the wood). Cozy and convenient! Nix the end cabinets and extend benches to the ends with storage below for toys, etc… baskets (texture/coziness) or built in storage(oak). The logs seem pretentious with a gas fireplace. Increase the window size…so you feel like you’re sitting in a tree house. I agree with other comments that it looks busy, and that storing decorative wood near a gas fireplace is a bit of a folly…. I think Jeanie has hit the nail on the head. Convert the “wood” storage to functional storage, and extend those benches out. The whole look will be a lot cleaner and simple. I think you’re forgetting about the visual impact the windows will have, and that those will balance out the TV/fireplace. Yes! I’m with Jeanie on this one. The black cabinets feel too heavy for me. Bigger windows could be really cool. And the built-in oak storage I can really picture. Yes, yes, yes. At the very least mix the black (bleh), and the unnecessary wood. We will all know it’s for show and totally pointless. If one of your other three fireplaces uses real wood, crest storage for it near that fireplace. Oohh love the treehouse-feel idea! Hmmm actually I agree with you guys – I also think maybe the glass and the black frames seem too non-mountainy? Especially for a family play area – I like the idea of letting the fireplace/benches/windows shine and paring back all the other elements (especially once you fill the shelves with things)… simple and rustic? LOVING this house tho! Thanks for taking us on the journey! This is beautiful! Anissa of HouseSeven Design has wood stored like that and has mentioned in her insta stories that people are constantly asking her if its an issue and she says its not! I say, make it beautiful and if you have to switch it out later- you put pretty baskets in and call it a day! But that’s because Anissa actually uses her wood for, ya know, fires. Not to mention this house is a vacay house. I cant think of anything more horrifying than going to a vacation house to relax only to find some kind of infestation in the family/playroom at kid height. Love the design, but I think that the sqaut fireplace is a dead giveaway that you’re using a direct vent insert. Real fireplaces need flues, and since you’re going for a rustic look, I think the structure of the fireplace should look as “real” as possible, especially since you’re considering storing real wood to enhance the “real rustic fireplace” feel. I agree! I was trying to figure out why the fireplace shape didn’t feel quite right, and this is totally why. I would extend the chute all the way up, get rid of the black side cabinets, and use the space under the benches for storage. Agree. Definitely on the “all the way up” train. While I love the look of open log “storage:”, I think logs seem really out of place and try-hard in a room where there isn’t a log-burning fireplace. Baskets for toys and books and games seem a better fit for this room. I love the aesthetic of the wood under the bench but it doesn’t make sense given your heat and glow insert. I also am not a huge fan of the fireplace not extending all the way to the ceiling. With the Frame TV it seems like seeing the TV from the sofa will not be a huge issue given how it hugs the wall. My brother has a very similar layout to what you’ve got going there (fireplace box surrounded by built-ins) but the box juts SO far out into the room that mounting the TV on top makes it hard to see the bottom of the screen from the sofa. I also think it feels more like an afterthought – like the room existed and you wanted a fireplace so the box was just added on top of existing. is there an adjustment to make to the cabinets to make them less top heavy? Bringing the door cabinet up to the height of the fireplace box and adjusting the top shelves accordingly? Or what about just shelves instead of the cubbies on top? Something about all those boxes is a bit much. and i agree with all the others that all that storage for wood when you have an obviously closed gas log fireplace seems really fake design-y to me, but I understand that the white logs are pretty to look at. I wouldn’t like the dust and dirt accumulation either. Team real logs for visual warmth even though you have the convenience of a gas fireplace. Thanks for sharing a picture of my living room as inspiration! #8 was my favorite before you even mentioned that you went that direction! Love the logs, the glass storage and the overall symmetry! I love this! And the TV over the fireplace looks great! Maybe it’s too high if the people on the couch will be, say, 3 feet from the screen. But if they will be further back, there shouldn’t be an issue with neck strain. We have a high-mounted TV and one of the things I prefer is that people can walk in front of the TV and no one misses a second of the action. I suppose the picture quality suffers a tiny bit by not being directly, horizontally, in your line of sight – but as someone who watches TV a lot, I haven’t been bothered by any degradation of the picture. Now the one thing I agree with others about is that the logs seem like a bit of a contrivance, since the fireplace is gas. If you’re thinking you’ll store actual, usable wood (for the other FP), it will not look as pretty or as nice. Those birch logs DO look pretty and very nice, but I personally am too pragmatic to enjoy the look. Thanks to your whole team for posts like this! Seeing your thought process, why something works better, why you rejected something, is amazing and so helpful to us mere mortals! Log storage near a gas fireplace looks silly. I guarantee you Charlie will constantly be pulling out those logs to build his own fantasy structure and it will be a battle to get him to refrain. Also, I thought you liked the NO TV aspect of life at the cabin. I would encourage you to go that route. TV/movies are always the easiest default but taking out the option will inspire you to play board games, cards, and simply conversing with friends/family. If I ever had a get-away, I’d want it to be very different than what I am accustomed to in the city. Otherwise it just feels like moving between houses. I actually like the mock up of the room. But then, I read the entire article so I understand what you are going for. This probably sounds snarkier than I mean (though clearly some people don’t read). But it’s because my builder installed a gas fireplace without coming to me with any questions or details and he’s already on my last nerve for 15 other reasons, so I’m really just envious that you seem more in control of the renovation process than we are. And don’t seem to be affected by how expensive the whole damn process is. Split logs look so much more authentic then round birch logs in my opinion. I’m sure you can get treated wood to make sure there is no bugs in the wood. I disagree with commenters who think the logs are tacky with a gas fireplace. It adds and warmth and texture that I love. I know its just a rendering and it’ll look incredible in person when its done, but right now I’m just feeling a little meh. I really appreciate the dark cabinets and think they’ll add depth and warmth but the plaster benches just aren’t doing it for me. I like the benches, but I wish they tied in more to the cabinetry and not the fireplace. Its just feels like something I’ve already seen a lot. I’m team #nologs. I’m also questioning not taking the fireplace to the ceiling. The big plaster box with a tv over it (even the most beautiful tv in the world) looks so builder-grade to me. I have no doubt that it’ll look amazing in real life all styled out. This looks fantastic! So excited. My own preference would be to NOT do the cabinets on either end and extend the line of the bench all the way across the wall. Cabinets below should be enough storage for games, and you could consider some floating shelves above although you don’t need them. Simplify. Looks awesome! I really like the color and texture choices on the rendering. My only thought is to put the drawers of the built ins at the bottom, not the top, slot. It’s the worst having to get down to crane your neck to see the back of a bottom shelf – that’s the slot I’d most love to have a drawer instead. When the time comes for that pinball machine, my father-in-law has an amazing selection and can customize the look, sound, lights, and artwork to anything you want. He truly has the most passion for his pieces. I love it! My one negative comment/question is: does anybody really ever sit in those built-in benches? I feel like I’ve been seeing built in benches everywhere a lot lately. And you’ve even got another built-in reading nook/bench in the bunk room. They don’t look comfortable to me? I’d rather read in an comfy armchair. To be honest, when you are hanging out with small kids, and you don’t ALWAYS want to sit on the floor, having spaces like this to sit down is really nice. You aren’t lounging there, you’re probably perching there and playing/interacting with the kids who are playing. My kids would jump off of those benches OR use them to get onto the top of the fireplace because I apparently only give birth to monkeys who love to climb. I for one, freaking LOVE it! I very, very much like the black cabinets flanking the fireplace and benches (and understood the storage underneath them was/is FLEXIBLE). I’m never-ever a fan of a tv over a fireplace buuuut, the Frame tv changes EVERYTHING. Also, I heartily disagree with the notion that this room looks ‘busy’ -to me it simply looks like REAL people could live here and do Real Life activities in the space! Your ability -and willingness!- to extend your designs beyond the parameters of social media -to OBVIOUSLY include human beings- is for me one of your defining characteristics as a designer. (I wonder if in part, the fact that the renderings don’t include the furnishings that will live in the room and balance the fireplace wall, is what folks are responding to..?) As always, your break-down of the design process is much appreciated -thank you! I completely agree. I love this design, especially the black cabinets with the black framing and TV. Emily Jane didn’t add this, but I personally really like the wood storage. If you buy birch designed for decor then you shouldn’t have bugs (other than the bugs we all get in any home, anyway) The idea that the kids might pull them out to play with sounds about right, but not like a bad thing to me. REAL lincoln logs!! This is a total miss, proportions are waaaayyyyyyy off. There is no function here: tv is way too high, windows are way too small, wood storage is way too ridiculous, bookshelves are too small for real storage, fireplace is a big snooze. What a mess. Yikes! That could have been phrased in a better, kinder way. Try again, you can do it! Ending with “what a mess” won’t work in your rewrite. Desiree, you cracked me up with this! Hope you’re an editor in real life – you’ve got a gift. How is this fireplace vented? I assume there is not a new chimney associated with it (which would add $$$) . I ask because I would love to put a good looking gas fireplace in my master bedroom, but finding a nice model with proper venting was a challenge. A neighbor installed one and when lit, I can definitely smell gas. Which not only is unpleasant but seems dangerous. I love the white look – one of my all time favorite fireplaces is from the Faux Martha, which you used as one of your inspiration pics. I personally still like the look of the fireplace going all the way to the ceiling, but I get what you are saying about the TV jutting out too far into the room. However, I do think that decorating with wood logs when you have a gas fireplace is a bit cheesy. I love the benches, but I’d do something different under. Even if it’s just cabinets with doors to hide any unsightly games or AV equipment. Trying to like it but it feels disjointed and cluttered. Like there’s just one too many things happening. And too many different sized squares that don’t relate to each other. No flow. Not like the inspiration images. As I look at it, just removing or changing one element seems to make the whole thing feel better. Whether its the size of the windows, the firebox which feels out of sync with everything else, or the cabinets on the ends…something needs to change. 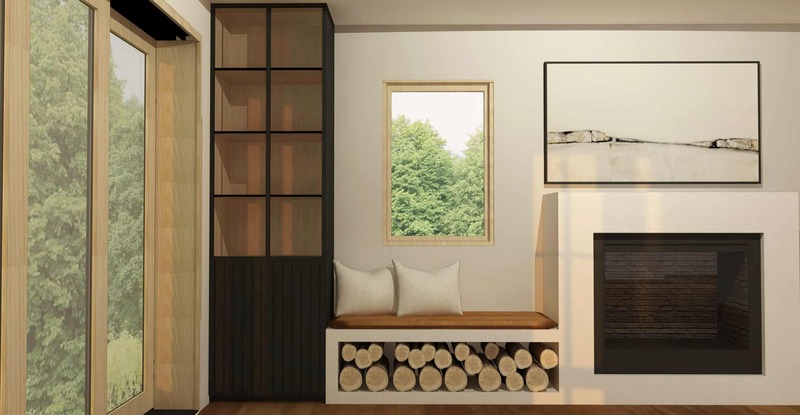 I LOVE, LOVE, LOVE the design, but why do you need log storage for a gas fireplace?? I think the design is very pretty, and if it is what you want, just go with it. I also think that some commenters are not factoring in that you can balance out the black and heavy elements on the fireplace wall with the rest of the furnishings for the room and you will make it look fantastic. I am curious why the only option you considered for the fireplace wall were the benches under the windows? I like the concept, but if the room is for kids and family, I would swap out the benches and put closed cabinentry running from the fireplace to the side walls (about the same size as the bottom of the black cabinents). You could keep the tall vertical shelf idea and run open bookcases up the wall on the two ends, similar to the inspiration. But this would give you only two horizontal lines – the top of the fireplace box and the top of the cabinents – instead of the three you have in the drawing. But again, that would be my preference to add some cool (and tidy) storage, but it’s your house and I like the concept of course. I also agree with the comment that with the tv so low and the fireplace box so deep, you run the risk of not seeing the bottom of the tv if you are seated across from it. Thank you, as always, for sharing your progress on the mountain house! I really like the overall look, but I agree with other commenters that the small box fireplace looks unnatural and too modern for a mountain house. Your concern about the TV being too far into the room with a full column makes sense. What if you did a half-width column to the ceiling? I think you mentioned the width of the fireplace is 18″ so what if the fireplace extended to the ceiling but only at 9″ deep? It would essentially create a 9″ wide mantel and could be a solution to both concerns (TV and mountainy-authenticness). Love these posts! This is exactly what I was going to suggest as well! I really like everything here (although I too am #teamnowood), but the fireplace not going all the way up looks a little out of proportion to me, and I’m also worried about being able to view the bottom of that TV from couch height. That 18″ mantle seems really deep. 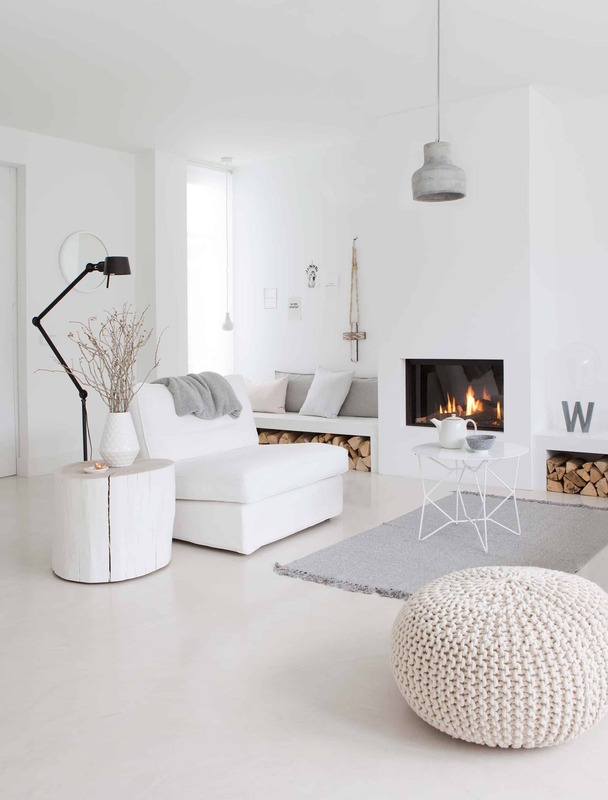 I like how in the last inspiration image (the remodelista one) the fireplace bumps out in 2 levels. In your case you could have the fire box as you have it now, but maybe halfway back (9″?) a vertical going to the ceiling, that the TV would sit on. Will you do a post on fake fire logs? Bad fake logs are something atrocious. I would love to see options that don’t veer into the glass or cannon ball realm of fireplace fodder. I, too, think it’s rediculous (not to mention gross and dirty) to have all that unnecessary log storage. Especially gross in a playroom where your kids are on the floor all the time. I understand the desire for the warm offered by the raw wood. Perhap find some beautiful natural wood to use as the bench and/or built-ins ala Yellow Brick Home’s Tree House mudroom. Just chiming in to say that I think what you have is perfection and that I disagree with all of the disagreeing comments below. 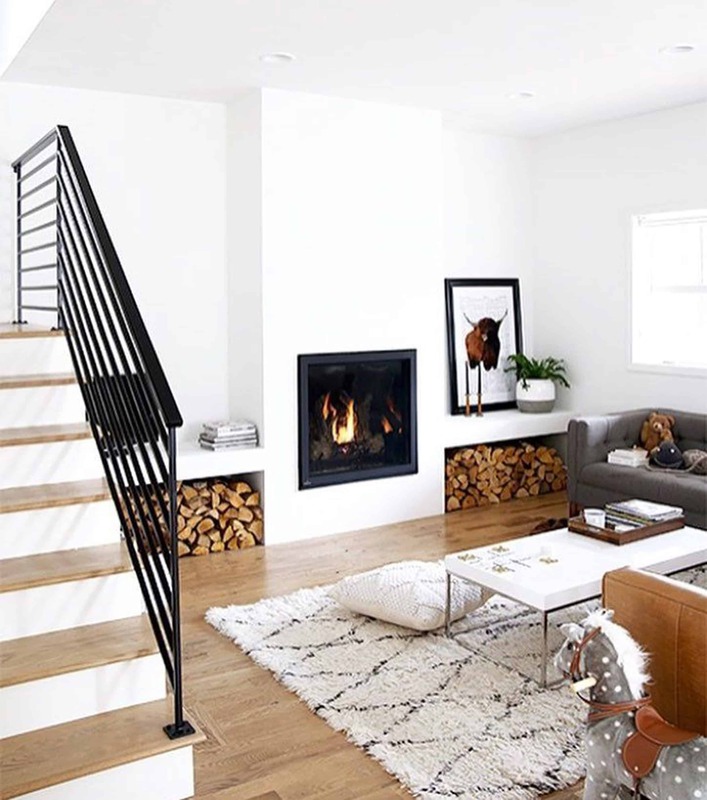 I think the birch logs that won’t bring bugs look gorgeous and it doesn’t matter at all that the fireplace is gas… Gas is sooo much more convenient and used so much more frequently and not every decorative choice needs to also be functional. I also agree that the natural looking wood makes the room feel warmer and more “mountain-y” as you say. Also absolutely LOVE the cabinets on the side, in the black color, please don’t change them! And I think the fireplace not extending to the ceiling is the way to go because otherwise, with the two cabinets on either end and the fireplace extending all the way up, it might look like three columns which would really feel heavy. Also think the bench selection you chose is perfect. Can’t wait to see the real thing! Didn’t see this addressed-Will there be any window treatments on the two windows? I agree – that is what I’m looking for here too. Its essential for cosiness to have window treatments in my book! Love the design. The way you have it though – kids sitting on the ground watching movies as they do – bottom portion of the TV will be cut off for them since your fireplace is 18″ deep. I am so glad that you finally mentioned plaster, I am always so surprised that it isn’t used more by California designers. We are in Colorado, and it is used ALL the time in all styles of homes… contemporary, modern, industrial, rustic, etc. Plaster or clay walls really do add such a sense of warmth to a space. If you are still looking for a type of plaster, American Clay is a great option, all natural, totally not-toxic and gorgeous. (just to be transparent, we are an owner of a clay installation business in Boulder, CO, so of course, I am biased, but since we aren’t located anywhere near you, I am honestly sharing my opinion b/c I think you would love it). You can learn more about it at American Clay’s website or ours, http://www.earthclayworks.com. The third fireplace photo (with the buffalo print) should be credited to thefauxmartha.com. Designing a fireplace is a lot of work! Who knew? The only suggestion I’d make is for the closed in storage under the glasses in cabinets on either side. I’d make the drawer separate from the cupboard space. Being at mid-level the drawer is in an optimal location for easy access. But you have to open both cupboard doors fully to get at the drawer – that’s a hassle. And I think kids will end up leaving the cupboard doors open all the time. Since the finish is dark you’ll hardly notice the horizontal line at the bottom of the drawer. Oh-so-beautiful. Great post, sharing all of the reasons for each of the potential solutions…thanks for sharing! Maybe the GC can set-in a niche on each side of the fireplace for lidded jars (to catch all of the firewood spiders that will creep up into the cozy benches)? This is how my mind works. Coming from someone who has a degree in interior design, I think the layout and materials you’ve chosen balance each other out very well! The black cabinets will tie into the kitchen island and black fireplace box, the wood cabinet interiors bring the mountain-ey vibe, leather brings the warmth, and white is that touch of refined while still having the warm plaster texture. Well done!! I love that your storage is flexible. Try the logs first (especially since you mentioned Brian reeeeally wants them). If you find that too impractical, you can always switch it out for basket/toy storage. I’m another person concerned with the TV above the fireplace, but only for fear that you’ll crane your neck trying to watch. My brother has this set up, and said that it is indeed an issue. Another commenter mentioned a TV bracket that let’s you lower it down and in front of the fireplace – That’s genius! I am an architect and I think all fireplaces should extend to the ceiling despite the fact that new gas inserts don’t need to. It makes it look and feel like an authentic fireplace rather than fake. its like putting shutter on the outside of the building that are not realistically sized for the window they are supposed to cover. We all know shutters are not typically operable these days and are only for show but if they amount to only half the width of the window they look silly and fake. I think you could even step it in and make the ‘chimney part not as deep on the edges and center to still have that mantel feel and the TV stepped back. but I still think it should go up to the ceiling in some vertical fashion. or it looks like one of those ‘TV’ fireplaces in a bad home design store. Sorry but Love the design of everything else in this image and think it could all stay the same besides that. Just my 2 cents as I didn’t see an option that explores this. What if the portion of the wall above the fireplace came out about 10″ and was in the same plaster finish? It would make the tv not feel so hidden behind the deep fireplace. And then what if the wall on either side of the fireplace was painted or paneled in the same black as the shelves? I love the design, but not the stacked logs. You will get a LOT of spiders and bugs in there…all those crevices will be perfect for bugs! And dust. And other bugs that love wood. I’d deep six them and put in the toy bins. I think the open shelving of the benches is too much with the open shelving of the cabinets. I think it pulls the eye in too many directions. Fireplaces should make a visual impact but this one feels lost among all of the storage. And that’s a lot of open space to maintain and keep clean and dust free! What if you did a lidded storage bench there instead of open shelving? You could do the bench in the same plaster for continuity. You would still have plenty of room for toys or whatever else you need, and the open shelves of the cabinets will frame the fireplace nicely and make a stronger visual impact. My grandparents had several cabins up at Mt. Hood, so I grew up going to “the cabin.” It seemed like everyone had stone fireplaces inside and out back then so that is what still speaks to me for a fireplace. HOWEVER, I love this design! It still screams mountain cabin to me with those birch logs underneath the benches. If you put the toys in baskets under there, it would no longer seem mountainy cabin relaxation. It would say “kid-stress” to me. Don’t get me wrong…I have 2 kids who are grown up now. But if I were visiting this room and saw toy baskets, I wouldn’t think relaxation. I would think stress that if the toys come out, they have to go back. LOL! The black shelves don’t feel cohesive right now. I think the benches and shelves should be the same color (all black/ all white) so that it feels like built-ins rather than pieces of furniture. Really not sure about the logs … excellent place for bugs & seems kind of gimmicky to have logs next to a gas fireplace. Baskets for toys and games makes SO much more sense. I am sure the finished room will look great! I am wondering if having the TV over the fireplace voids the warranty because of the heat that rises from the fireplace? Top that with a gorgeous wooden mantle. It would look way cooler if you could make the windows larger, with wood storage only on one side … I love wood storage areas that go vertical and possibly all the way to the ceiling. This design is oo symmetrical in my opinion. 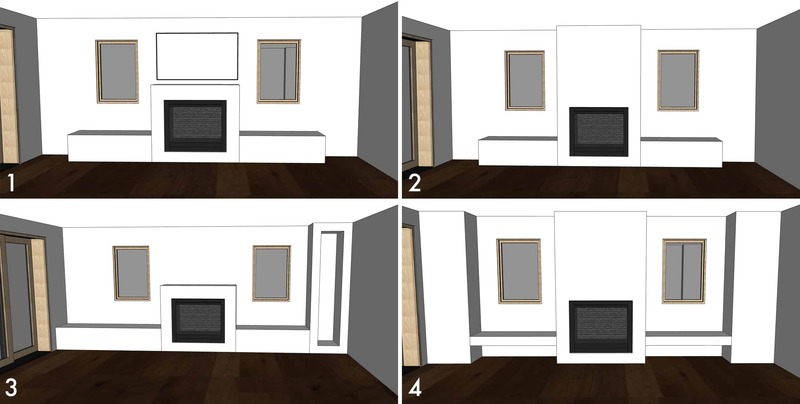 Wait, so there’s going to be a double french door (at an angle) next to a triple set of sliding doors? And they both go to the same place/backyard? That seems so “door-y” like too many different doors together. But I have a hard time visualizing. Make the cabinets a blond wood and it will be perfection. Love the design but having the logs inside will attract bugs and dirt you’ll be constantly cleaning that area. It quite messy actually. (I currently have that problem) i try to discourage any of my clients who want something like this… Honestly that’s space could be more useful for storage either than just showing off logs, even if you’re having a wood burning fire place. First of all, I would die to have any of those spaces! They are all amazing! You are amazingly talented! But as I thought more on which one really seemed appropriate I don’t think the final rendering is “it”. I think it will look too busy once life is happening in this space – no where for the eyes to rest and the soul to breathe. 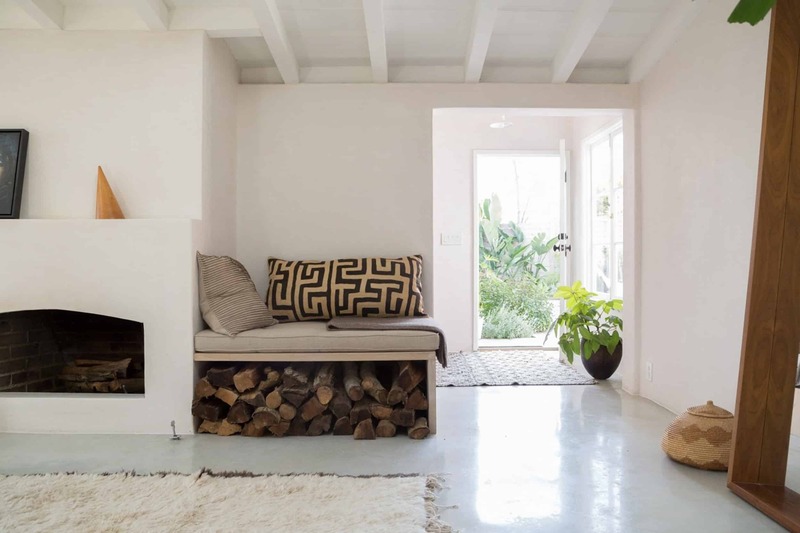 All of the inspo pics allow for visual margin and I noticed that they all have fireplaces that extend all the way up and benches that extend all the way out – keeps things clean and continuous. Just some things to consider. It’s beautiful, but will you be able to see the tv if laying in front of the fireplace? I’m thinking of Birdie as well as myself who would be on the floor playing a card game or with the kids. Also- it looks like that ledge above the fireplace is too close to the TV to hold props, so would it just be giant dust collector on white plaster? What about a inverted mantle- like a space that cuts into the wall opposed to sticking out between the TV and Fireplace box? Is that making sense? I’ve never seen it before, but it might fulfil your desire to take a risk that would be interesting to look at, but still create the chimney illusion. Loving that we get to follow along! Add me to the list of people who prefer the fireplace going all the way up! Also, as for the benches, are they deep enough to sit sideways & read or work on a laptop and lean against the cabinets? If not, they probably won’t get used except by children & pets. I’d definitely make sure they’re deep enough to be versatile. As for the cabinets, I like the idea but they seem a little dark. What about making just the backs of the cabinets dark & the fronts/shelves something lighter? Maybe use dark pulls on the cabinet doors? Wow! This looks lovely. I do agree with some commenters that the fireplace stopping without the appearance of a chase or chimney looks really modern. We have a plaster fireplace as well and the top is built out but less so than the box surround. It adds a nice bit of dimension, keeps it from feeling too modern, and solves the problem of the TV sticking into the room or sitting too far back to see fully. Can’t wait to see how this all looks in the room! Okay totally random idea here but what iffff…you did the fireplace all the way to the ceiling and mounted the TV above it, but carved a little inlet for the tv so that it was still flush with the fireplace? I do really like the look though and think it would be a cozy fun family room! I’d love to see 4&8 combined! I just love the look of bringing the fireplace all the way up and think the cabinets would balance it all out nicely. Overall I really like it. How about some wall mounted lighting projecting from the sides of the shelves that could be used for reading when sitting on the benches? Kind of like in the bunk room- and you could even use a ‘micro bubble sconce’! I think it could help up the ‘cozy factor’ Will you have no window treatments/blinds? Okay. So I like it, but I feel like I want the shelf coloring to be the inverse: it would be really cool if they were wood-tone, and the insides of the cubbies were black instead (to echo the fireplace). I really love the vibe of the whole and dig the wood cabinet interior with contrasting exterior on the cabinets. I agree that the fireplace should extend up to the ceiling. It would avoid that “stuck-on” firebox look. Though you’re already mitigating that with the seating on either side, it still might read more authentic. If you brought the mass to the ceiling, then I bet you’ll have to go with the smaller version of the Frame which looks like it would still work well for viewing but hard to say as a reader. Also, though it would protrude into the room more, as you mentioned, if you stretched the whole unit to the edge of the door casing, it would make the built-in seats less of something you sit ON and more of something you play IN, which could make a world of difference when it comes to the kiddos engagement with them. You could already be at the margins of creating a comfortable seating area with furniture though. I’m sure it will look beautiful and I can’t wait to see the finished product! Also, maybe the cabinets want a thick plaster frame around them like the bench? They will be slightly more narrow so you could just do one door each. You might have to play with the finishes/ details of the cabinet itself but it would tie everything together. Perhaps consider closing in the wood or toy storage sections under the bench – and add lift-tops to the (now closed) benches. If you line the new storage bins with cedar – you can store out-of-season clothes and blankets in there. If not – Do try to line some of your new storage closets in your mountain lodge with cedar — really helps to preserve and keep out-of-season clothes in good shape. This sounds like a great and practical idea! I have to also add a vote for “no” to the logs. You could have a real safety issue if a guest mistakenly thinks they should put them on the gas fireplace. If they can’t actually be used in the space and are just for “show” for a photo shoot and then will always be something else from then on out – it would make more sense to design for the intended future use. I find it busy and the faux log thing awkward (I know you are a stylist, and I can see setting that up for a shoot – but full time? – it just feels silly). The Busyness wouldn’t be a big deal if you weren’t planning on facing it the whole time you are in the room. I really really like #4 with the floating benches & firebox to the ceiling- I would consider making the shelves simpler (say plaster sides with large thick wood plank shelves similar to what Lauren Liess did in her library a couple years back) or removing them all together (how much storage do you need in a vacation house? things get musty in unused closed cabinets). I would Use the areas under the cantilievered floating benches for woven pullout baskets of toys (think how easy it would be for the kiddos to get to toys and to put them away!) – and I would also consider NOT doing cushions so that the kiddos could use the benches as a play counter (but that is just me). Also will it be an eye strain to be staring at the TV in between two windows (do you have shades in mind that I am not seeing)? would it make sense to move the tv off to the right and close off one window? P.S. Does the TV have to go above the fireplace? What about on the wall to the right of the fireplace? I can’t wait to see what you do with some of these design challenges! 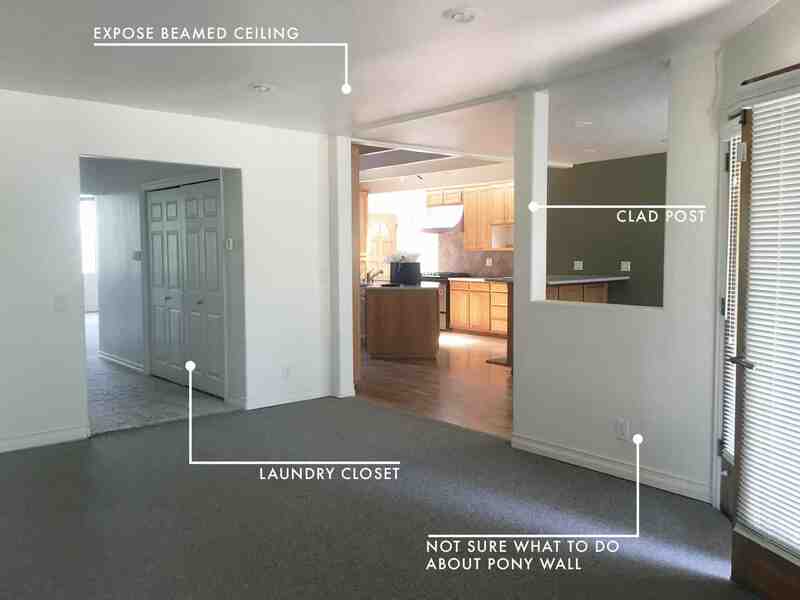 We have some similar ones (like the pony wall) in our new house and I can’t decide if we should rip it out or leave it, or what! I can’t wait to see what you do with it! Love this stunning fireplace in white Segreto Stone. My personal choice would be to move the TV to the blank wall opposite of the sliding glass doors, and do a cozy corner sectional in there, open sides to the fireplace and TV. You might even be able to see the kids from the kitchen/dining room that way. The TV could be lower on it’s wall, and the fireplace and shelves could be the star of that wall. It might be hard to stare at a TV with two window flanking it with bright light coming in. I love the design otherwise and I think it looks very cozy. I have to agree with most of the other comments – the fireplace will look much better if it goes all the way to the ceiling. It also seems like others have had trouble seeing the bottom of the tv when it is set back like that. Have you considered carrying the fireplace all the way up and then recessing the tv above it so that the face of the tv is flush with the face of the fireplace? I love it! It seems so thought out and deliberate. The wood may be editorial, but that’s what you do! As you said, you can always switch it out for baskets and bins. I understand some opinions about the shelves seeming slightly overwhelming with the black color in the rendering, but I can imagine in real life that it will all balance out. Perhaps a dark stain (maybe that’s what you intend to do and I missed it) instead of black will make it cozier and less severe. I’m so jealous of this room you’re creating with your family wishes in mind. I’m interested in the comments about the strain of looking at a tv that is not at eye level. I agree it could be an issue. My neck hurts just thinking about it LOL. I know you don’t want to take up floor space, but in the big EHD post about the Frame TV awhile back I noticed there is a cool tripod (I think) stand. That might be something you could use tucked in the corner in front of one of the storage/book shelves. I know it’s not ideal but perhaps better than eye and neck strain from looking up at the tv. Symmetry is nice, but I haaaate when TVs are over the fireplace. It’s a terrible viewing angle and not at all functional. 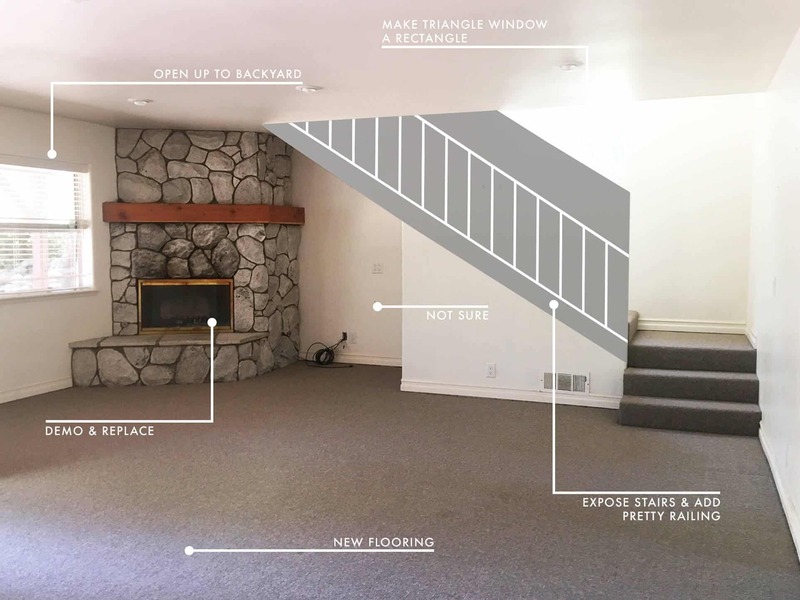 I see it’s probably too late from your photos, but I would maybe have tried an offset fireplace so the Frame could be on the wall to the right of the fireplace at the correct viewing height without losing the enjoyment of the fireplace. Opens up the top of the fireplace for styling or storage as well. Like many others, I am also not a fan of all those logs just for show next to a fireplace that doesn’t even try to hide that it’s an insert (no chimney — a thing I don’t mind, but works against the idea of logs). Maybe figure out some pretty log storage next to the other actual wood burning fireplace? Then it can be beautiful AND functional. I have the same thought as many, questioning how necessary the decorative wood is (all I can imagine is the dust, never mind the bits of wood that might break off), and honestly was bored of the idea after scrolling through the super similar inspiration pics. I don’t necessarily think this design is too busy, and believe it will be more warm and come to live with textiles and such, of course. I appreciate it’s symmetry a lot versus some of the other mock ups. As toy storage goes, maybe some rustic wooden toy crates on wheels instead of the faux firewood? I love the idea of toys stored in drawers in that space. Also, in the name of keeping things open, and because of my own general dislike for overly tall furniture, I’d change the dark units on the side. I’d have the same sort of cabinets on the bottom, but then instead of the cube shaped uppers, I’d do some simple wall mounted open shelving to let the space breathe a bit more. This would make a couple of nice surfaces on either side of the benches for something decorative. Or maybe no open shelves, but a gorgeous sconce light above each cupboard unit? Kind of depends on how much actual storage you need, I guess. I agree with the comments about the fireplace looking so much better when it goes all the way up to the ceiling. It just looks too choppy in the final version. Also, I wouldn’t worry about critters, as long as you use freshly cut, clean birch logs. We have some birch logs for display and have had no issues with critters. Just check them out before you bring them in the house. And don’t store them outside before you bring them inside–bring them inside right away. Emily I love seeing your design process…. buuuttt as you are making new windows in the fireplace wall, why are they not going down further – it would be nice to be able to sit on the window seat with a book and look out at the view. When you are sitting on your sofa will be be able to see out of these new windows? Not sure if this is because of planning regulations that they are this size. Perhaps having a projector screen like you have in your other house would be a good solution to the sore neck/tv too high/can’t see the bottom discussion. Which would then give you scope to style up the mantel, there’s nothing worse than having a mantel you can’t style up! I also liked the comment of having open shelving rather than the boxed in glass front unit, although he glass front units do feel quite kitcheney and maybe this ties in well with your plans for the kitchen? Wow sorry to go on, its all coming together so well. Looks too late to do this, but I would’ve placed the fireplace off-center (to the right) and foregone windows. I imagine window will be placed elsewhere in the house. If you have a TV, you don’t want glare. If you have a fire going, you don’t want to watch the TV above it. Besides, that TV is high and will be uncomfortable on the neck watching a movie. 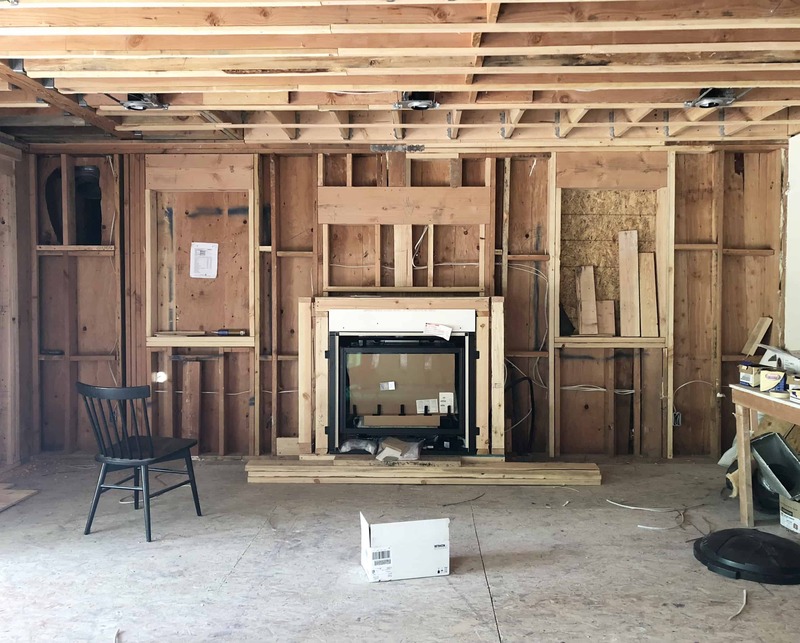 Placing the fireplace off-center and removing the windows allows an open space for artwork/TV to be at a more comfortable level while not taking away from how interesting the space should be. The style you obviously like most is taking the fireplace all the way up to the ceiling. I think the current overall rendering looks too traditional. Not mountain-y or rustic or Scandinavian.